The path climbs steeply, and I follow a chap who seems to be going at a pace I like. Later I catch up with him, after a couple of unmarked path forks where he looks round at me to see if I'm following him! Nicholas, a French chap who looks a bit like Keanu Reeves! Chinese mother and Black father apparently. 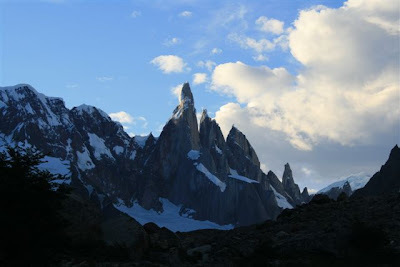 We wander along, reaching a mirador with a fantastic view over Fitz Roy. I should mention that the weather is marvellous. Fitz Roy is famed for being shrouded in cloud, and it would seem that yesterday and today, I am blessed with big blue skies and glorious sunshine. In fact a little too hot for trekking. Chris Fisher keeps sending me the BBC gloom and doom weather reports from home. Thanks Chris, it's great here! After a couple of hours, we reach Campe Poincenot where I dump my stuff on the ground. It should be okay, and I'm taking all my valuables with me. 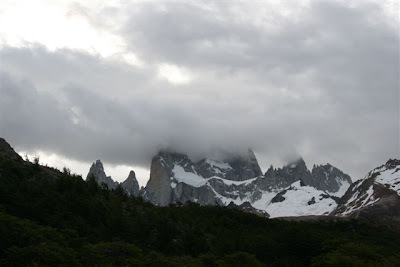 Most of the mountains here are all named after French people, and it was a French team that first conquered Fitz Roy. It is named after the Captain of the Beagle ship which brought Darwin round here, but most peaks on either side of it have French names. Poincenot is the name of a mountaineer who died trying to climb it. I split from Nicholas who is heading where I will go later, and I start the climb up to Lago de los Tres [GPS: 49.27997S, 71.98599W]. 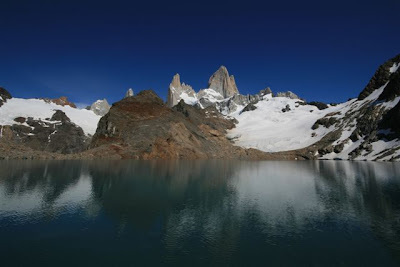 This is the classic "must-see" view of Fitz Roy, climbing up to a lake nestled just below the main peak, with a glacier flowing down into the lake right in front of you. 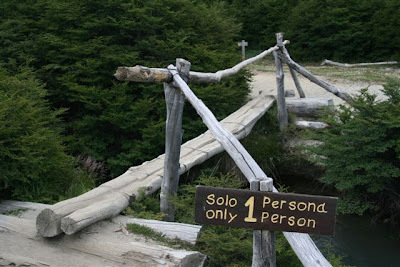 I overtake several people on the way up. One chap explains that he's just waiting for his missus. Yeah, sure. Wish I had excuses like that! Pant pant pant! It's not a hard climb actually, but it's hot. Most annoyingly, there is a highly irritating species of fly about - large, with a strong body, and a tinge of blue. This is how it goes with these guys: they buzz towards you, and circle your head a couple of times. They like dark colours, like brown hair, or my dark camera bag. Their buzz is extremely loud, so there is no doubting their approach as they whizz past your ears. Having circled a couple of times, they land on your head and start walking about. At this stage, if not before, you swat them. They take off, circle again, and land again. If you manage to whack them in the air, they fly off from your whack, do a U-turn, and come straight back in. If they land on your trousers, you can get a good whack in, then they fall to the floor. However, don't be fooled, they are merely stunned, and after 10 seconds or so get up and fly off, or back towards you! So the technique is to stamp on them whilst stunned, and remember not to hit them too hard if they land somewhere sensitive in the middle regions! Damn flies! So, I manage to swat the flies without falling off any cliff-edges, and reach the top. It is beautiful. As Nicholas said to me, you will probably want to spend some time up at the top. 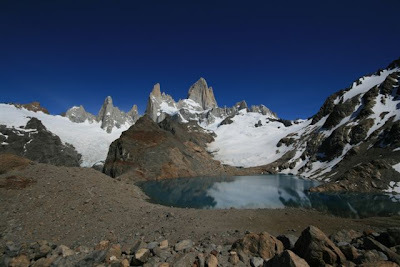 One comes over a stony ridge, reaching a lake sitting right under Fitz Roy itself. I find a rock sitting in the lake, and perch on that, enjoying the view. 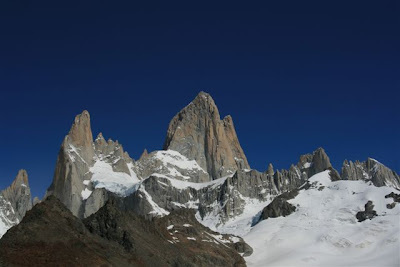 Fitz Roy is an enormous tower of granite which is so steep that snow doesn't stick. It does, however, attract lots of cloud, so I am very lucky to have a day like this! After a while, an Argentinian couple sit near me and talk loudly. It's too much to bear, so I decide to head down. I skip down, giving positive messages to those on the way up, and of course swatting as many flies as possible. 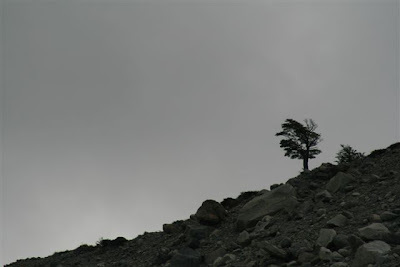 At the bottom, back to the camp site, pick up my bag, and head round to the other side of the range. This is a several hour walk, listed as Day 2 in LP (pah!). And at this point I notice.. My LP has gone! 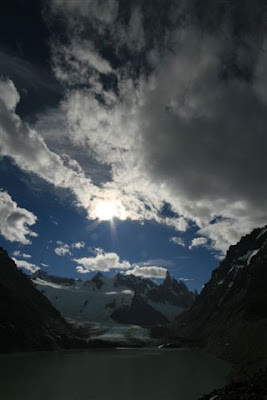 My dear Trekking in Patagonia Lonely Planet. I had it tucked into my camera bag and it must have fallen out. Idiot! I can't bear to return by this stage, so resolve to try lost property, if there is such a thing, when I return. Careless idiot! I've lost my guide one day into the first of the two treks I bought it for! 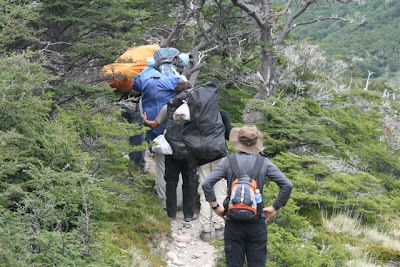 The trail becomes quieter as soon as it leaves the Lago de los Tres trail (which people do as a day-trek from Chalten). 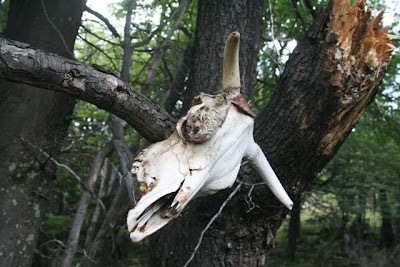 It follows a rocky riverbed (the Rio Blanco) for a couple of hours. This isn't much fun to walk on. 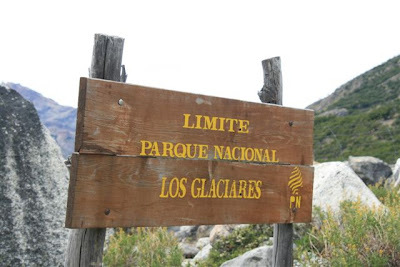 I pass a big glacier, Glacier Piedras Blancas, and eventually reach a fence which marks the boundary of the National Park. Does this imply a thoroughfare? Perhaps.. I look along the fence. It is sealed all the way along. There is a small gap by a large boulder, but nothing which one would describe as a "stile", as LP suggested using. I wander whether perhaps people are not meant to cross here any more. My map indicates a division of the path just to my left. Perhaps I missed the path leaving the river bed and heading up to the forested bank. I double back and head up the very steep bank. It's not easy. Once up, I find no path, so head up again. Very difficult going. By this stage I am fairly annoyed, and resolve to forge my own path, which ends up crossing the fence anyway, further up, and hacking through all sorts of undergrowth. There are obviously pumas about, as I find a rabbit carefullt laid out like a plastic kit. Bones here, fluffy bits there. No meat left though, not an ounce. 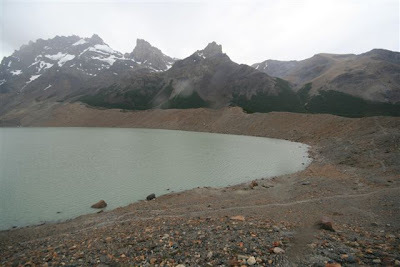 Finally I find a trail again, and head round up the valley towards Lago Electrico and my destination, Refugio Los Troncos, at [GPS: 49.22744S, 73.01374W]. 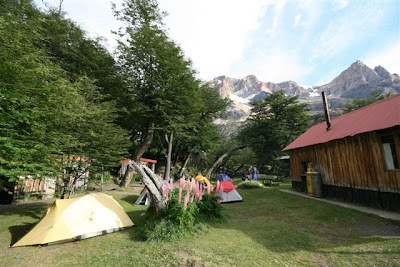 The campsite is in a windy valley below Lago Electrico, with winds blowing straight down off the Hielo Sur icefield, but is sheltered by a large rock (hill?) left my the retreating glacier. The woman who registers my arrival is a miserable so-and-so. I learn from others this treatment is not exclusive to me! I pitch my tent, and get chatting to a nice English couple next to me. They have a bigger version of my tent, and I wish I had theirs! Room to do things! My tent really only has enough room to lie down. Perhaps sit up as long as it's not wet. Nothing else. I want room to run about! These feelings may have been prompted by some others having the large North Face tents which are big enough to have a chandelier hanging from the middle! 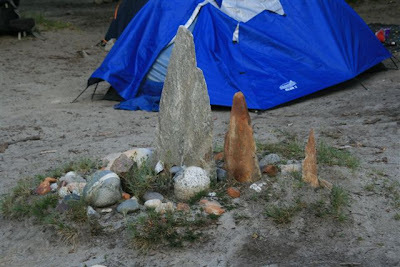 I later learn these belong to a mountaineering group headed by Jim, the current American Alpine Club president, who are developing a new route up Fitz Roy. 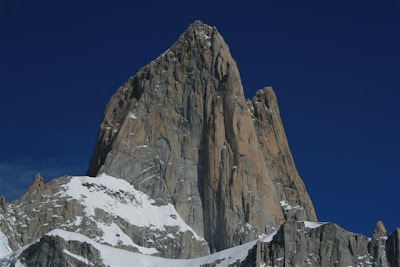 They have an ice-cave half way up and are kitting that out, thought currently waiting for a window in the weather suitable for attempting the climb. Jim is full of stories of his climbing exploits, but they all seem to take place in the 70s. What has he been doing for two (and a half) subsequent decades? He has apparently climbed on all seven continents though, so respect for that. He also has an English wife from Loughborough, which he can pronounce correctly, so double respect! 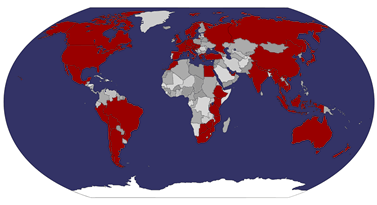 The standard pronounciation for Americans is something like "Lugar-bor-ugah"! Dinner is a soupy onion and carrot thing. 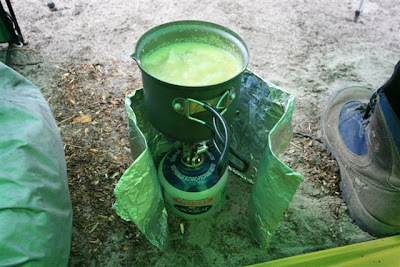 I've learnt to be conservative with these Maggi soups - I poured the whole packet into my pot when camping on the road near the border, and nearly died of salt poisoning! Not making that mistake again! I realise I've left my only knife in town, so have to use a spoon to cut the carrots. Amusing. The weather is not great, and my English friends are drawn to town and nice ice-cream. I don't blame them. 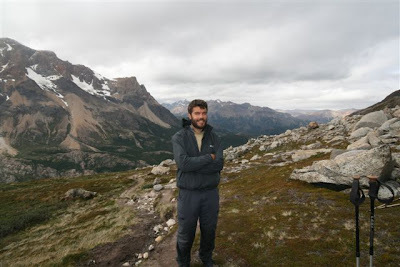 I chat to a nice English chap called Fred who, in an incredible stroke of luck for me, has the LP Trekking in Patagonia book and is looking to offload it on someone. He kindly hands it over to me, and I wonder where all this luck on my part is coming from, or rather how I will pay for it later! Fred has done exactly what I was thinking of doing, i.e. Torres del Paine circuit branching off to a small little-travelled smaller trek (I forget the name - Zapingu or something). 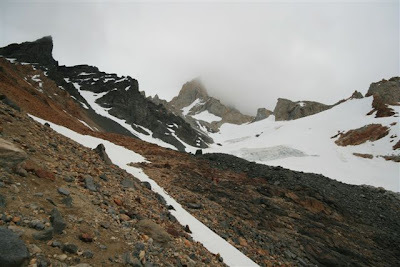 I head up to Cerro Electrico, which LP describes as a moderate-difficult climb, but with "stupendous" views at the top if the weather is good (it isn't) with a leisurely start - about 11am! I follow a pair of Americans, whom I talk to - a mother and daughter, who are very nice. The mother is about 60, and does very well, keeping pace (take note Dad! ), and carrying the bag for both of them. We reach [GPS: 49.23851S, 73.02597W] and decide to call it a day. We have ascended about 1100m I believe, though my GPS is playing up, so difficult to be sure - I've estimated from my map instead. If you plug that GPS reference into Google Earth and it shows you Croydon, let me know, I'll change the batteries! They lunch in a sheltered spot, offering me some salami and Californian cheese. The view is fairly good, but we are now hitting clouds, and there is little point in going further. Next, the bit we were all dreading - the long descent. The trail up was very steep - according to our mountaineer friends, the path was laid by some Poles, who seem to have no concept of switchbacks, hence it tends to head straight up the side of the hill, with much of it covered in scree or loose rock. Not fun to go down, except for some bits where it's almost possible to "surf" down the rock - reminds me of Fuji-san! Reaching flat ground is truly wonderful on the feet and knees, and so we celebrate in the pretty garden with a can of not-especially-cold beer. Still tastes good. Dinner is similar to yesterday, but this time I splash out and open the can of machas. What are they?? Strange sea-foody things that smell almost..meaty? I prod suspiciously. 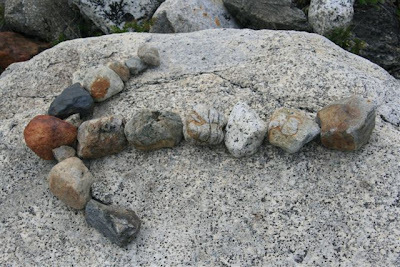 One of the climbers walks past, so I ask him what machas are. He thinks clams or oysters. They don't really resemble either. Oh well, I throw the lot into the pot. Half way through eating, I decide that about 20 of whatever they are is a bit much for my sensitive palate, so bin a number of them. The extrvagance of it all! Breakfast as always is bread rolls with dulce leche, and two and a half cups of tea (the amount of water that my pot holds). I resolve to lessen the amount of water in future to leave me with two cups. Clever forward planning, eh? Err, no. So off we go, back to Campe Poincenot. 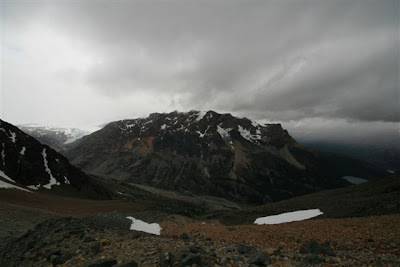 In the absence of a marker pen..
Half way along, the trail passes the glacier (Peidras Blancas) that I saw previously. I almost don't "bother" to go up to see it - that is how common the amazing scenery is here. Something that back home I would travel long distances to see, here I almost dismiss with a wave of my hand. I do decide to head up in the end, and it is worth it! I sit for a while, enjoying the view, and Lago Piedras Blancas, and hoping a chunk of ice will carve off and fall to the water. Zoom lens at the ready. Not to be though. The trail up and down is really nasty, involving climbing over enormous boulders and jumping glacial rivers. Would be fine normally, but with a full pack on your bag and trekking poles, not appreciated in the same spirit. A couple of times I lose my footing, not nice when you're fairly high up and have 20kg extra on your bag to help you to fall faster! 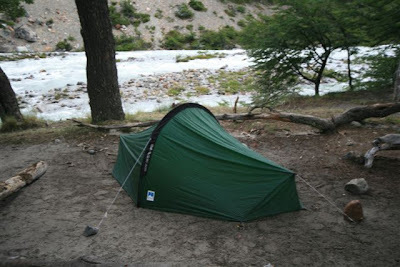 I reach camp and put my tent up. It's busy and dusty. All done by 2pm. What now? Cloudy up above, not worth climbing up again, so I decide - town is near enough, I'll pop back in! The trek down is supposed to be 2 1/2 hours, but I manage it in an hour and a half. 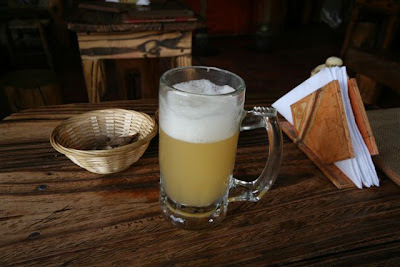 At the microbrewery, I enjoy a lovely late lunch of trout ravioli, washed down with an appropriate beverage or three. After lunch I bump into Sonny, the Dutch chap. 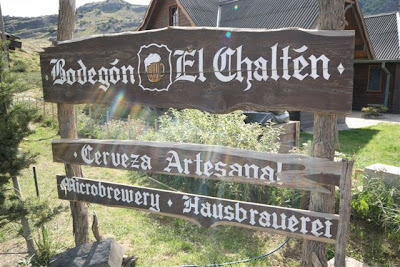 We agree to have a beer in El Calafate, where we are both heading next. He of course is cycling there! 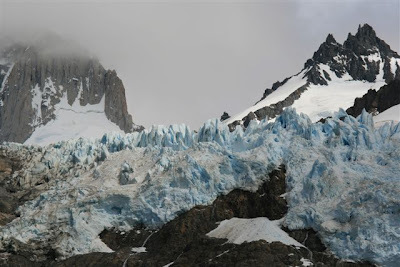 Afterwards I quickly check my email, and discover to my delight that I have a reservation on the Navimag boat for the 9th February, from Puerto Natales (the access town for Torres del Paine) up to Puerto Montt in the North. 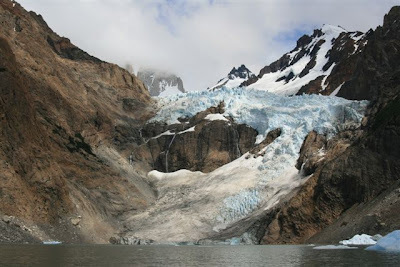 It's a 3-4 day trip, heading through the Chilean Fyords, passing beautiful scenery, sea lions, and is supposed to be very enjoyable. I am a happy bunny! I head back up, stomach full and in good spirits. Let us say that I didn't ascend in quite the same time as it took to descend! Back up, and my tent seemed to be surrounded by Israelis. They were being noisy, talking loudly, and had a radio going. This was fine, until it got late. By midnight you can imagine how irritated I was. Even through earplugs I could hear them well. Finally some quiet, only for them to start at 4am again! Talking loudly. I am beginning to have the same opinion of Israelis as Ram! Nearby the camp site there is a stream running past. Signs declare that all water here is drinking water, and ask you not to wash in the stream, instead to collect water in containers and wash away from the stream. I fill my Camelbak from the stream, and have to say, I couldn't see a single dot of dirt in two litres. 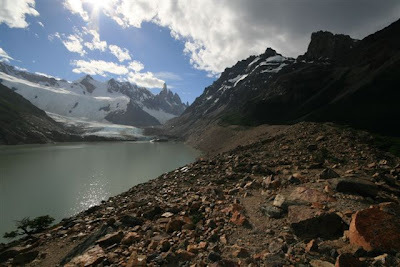 I head round to Lago Torre, my final destination on this trek. To my dismay, a troop of Israelis heads round too. 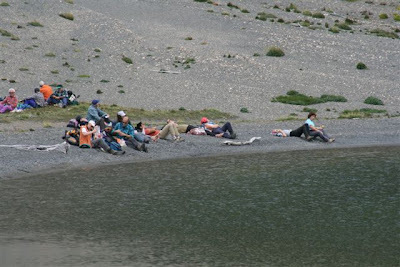 I almost consider abandoning the trek, but bump into an Australian couple from Adelaide, whom I knew from the Villa O'Higgins trip, and they say there is a noisy river next to the site and it's a big site, so should be okay. Plus I'm not going to let them "win", though ideas of slashing their tents and murder were beginning to gather momentum in my mind! The trail round is fairly pleasant, but for most of it there was very light rain, and overcast conditions. Not enough to put a coat on, mind. At one point I am looking at the ground as I walk under a tree. There are thousands of small green leaves lying on the ground, as if someone has been trimming a hedge. 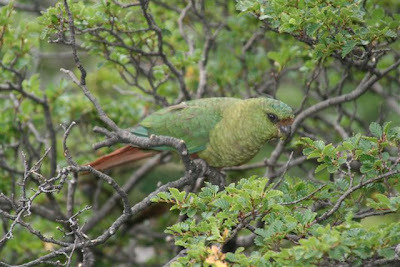 At that moment a huge squark from above reveals a tree full of parrots, all nibbling away on the poor old tree! They are beautiful birds, especially when they fan out their wings, but it's extremely hard to get photos of them, buried in the tree, constantly moving, and with the bright sky behind. 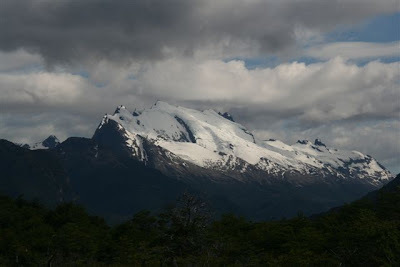 I watch them for a while, then head into the valley up to Lago Torre. It's raining slightly more by the time I pitch my tent in Compartmento de Agnostini. Another dusty site. Hmmm. Hope the river doesn't swell too much at any point! Lunch of "fried" rice with tuna. Tasted slightly better than it looks! I head up to look at the lake anyway. 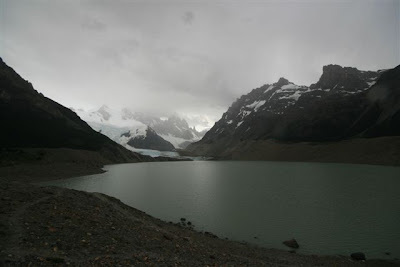 This lake sits underneath several glaciers, primarily Glacier Grande (the big one! 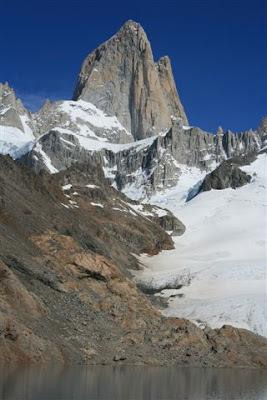 ), but also Glacier Adela and Torre. 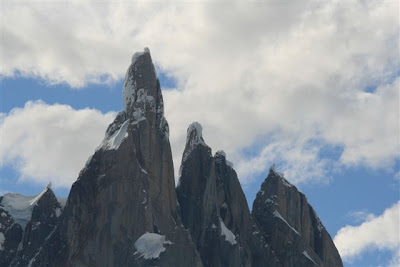 Above these are several peaks, the most impressive of which is Cerro Torre, which is an extremely sharp peak which apparently for a long time was considered unclimbable (my mountaineer Jim sneered at this comment from LP!). Not much sign of mountains! 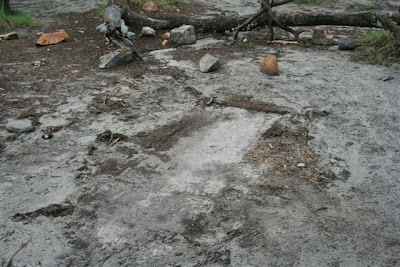 There are lots of signs of glacial activity, from the small icebergs collecting at the edge of the lake, to the enormous terminal moraines sitting across the valley. 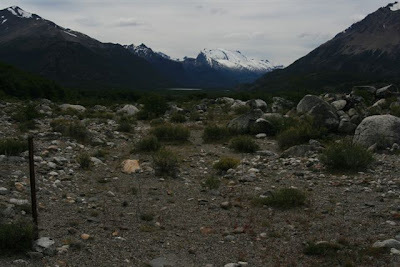 This is the pile of rocks that the glacier pushes down the valley as it advances. Here there is a double layer of moraines, so I assume the glacier came down, retreated, then advanced again. The moraine is absolutely enormous, and really gives you an idea of the power of the glaciers. 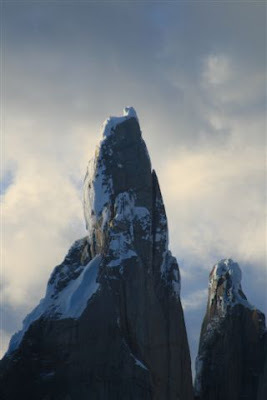 Fortunately for me, the weather then clears, and I get a good view of Cerro Torre, and the whole range. 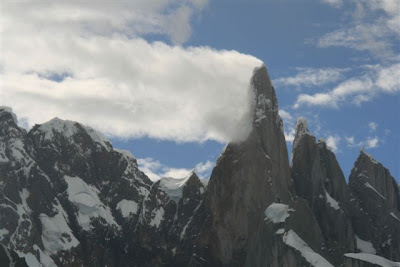 Interestingly, the clouds seem to stick to the summit of Cerro Torre as they float past, then once the rest of the cloud has passed, the mountain appears to stream out a cloud almost out of nowhere, which continues for another 10-20 minutes. 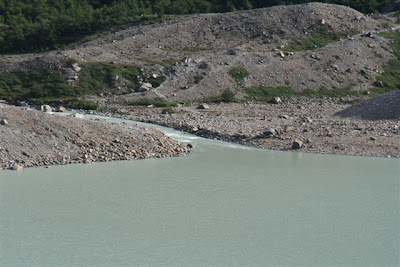 My drinking water supply exits the lake! I retire to my tent for a while and read, waiting for sunset. I hope for a nice colourful cloud effect, but it's not to be. Also, it gets dark quite late here - perhaps 10:30pm. Finally the sun sets behind the mountains. 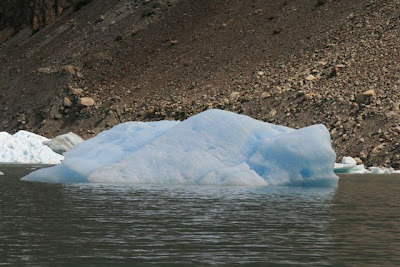 Sitting in my tent, I hear a few rumbles, which I assume to be ice breaking off the glacier. I curse myself for not seeing it happen. Suddenly it goes dark. Suspiciously fast. Then the first flash occurs. A thunderstorm! This goes on for hours, becoming just rain for most of the night. I doze off in the early hours, only to wake with something touching my face! I jump, and watch a large mouse (rat?!) scrabble across the inner lining of my tent! Yucks! Where I sleep, my face is very close to the tent material, and this thing was walking over my face just through the thin material! There is no food inside my tent, but presumably he was making sure! It's not so easy to get to sleep after that! I wake at 4am, well actually at 3:57am, and switch my alarm off. How does my brain do that?! I had planned to go up to watch sunrise, as apparently there is a brief moment when the sun first comes over the horizon when the mountains are lit up red. Doubt it will be happening today though given the rain, so I go back to sleep. My tent is wet. In the morning I emerge to survey the damage. My tent is covered in mud, including the inner tent where the damn mouse ran about. It's horrible packing my tent up without an opportunity to dry it. And it's sandy mud, the kind that clogs up zips etc. Where the "rivers" flowed last night! When it finally "opens", she takes my order - pizza and beer please! She thanks me for my patience, which I find amusing, as you need plenty of that to frequent this place. I don't make this comment to her. Full and satisfied, I collect my things from my hostel, then head to the YHA to pack and check internet. It takes some time to pack, and seems like an impossible task at the beginning - how to fit a large rubbish sack full of things into a backpack that is already full! I manage somehow, and take the bus. Only on the bus do I realise that I've left the power adapter for my laptop in the YHA. Idiot! On arrival in El Calafate, which is a decent-sized town (I realise that it is the first town my Footprint guide has had a map for since Buenos Aires over three weeks ago! 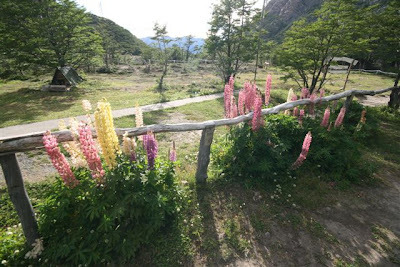 ), I decide to go to Calafate Hostel, which is the sister hostel for the one back in Chalten. 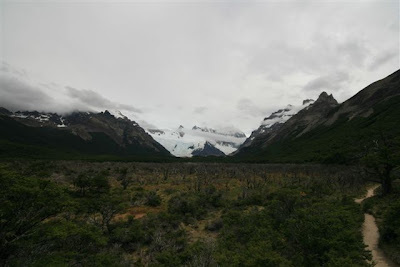 Within minutes my power adapter is to be put on the next bus, I have a bed here, and a tour to Perito Moreno Glacier, a map, and internet connection. 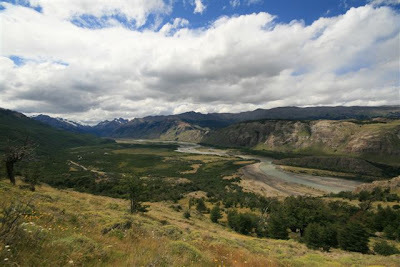 The next morning, I'm scrubbed clean (ahhhhh) and I get the last seat on the bus the next day to Puerto Natales! Ahhh, things will be okay after all! Where is all this luck coming from? !